I wish they taught shopping in school! A while back, I purchased some vintage door knobs for the porch door project (a/k/a Porch Fest 2013). And I was happy about it! Ignorance was bliss — once I started working with the knobs, I found I couldn’t use them, and I couldn’t improvise any sort of doofus solution. So I ended up buying more knobs. D’oh! If you are shopping for old door knobs to use in your home, here’s how to make sure the process goes smoother for you. Obviously there are a couple of knobs. The knobs are connected by a threaded spindle. (Some vintage sellers call this a “shaft” or a “rod” if they don’t usually sell doorknobs.) The center part of the spindle is about a quarter-inch square. 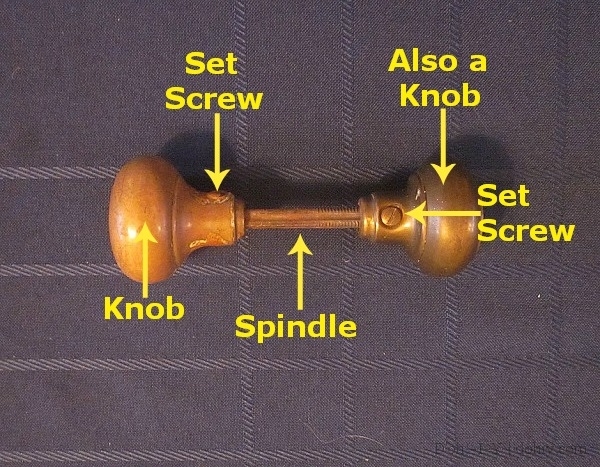 The knobs screw onto the spindle, and then are further secured by a set screw that threads through a hole on the side of the knob and snugs up to the spindle. This stops the knob unscrewing itself every time someone turns it. Modern doorknobs and latches are built a little differently, but there’s one basic similarity: the doorknob turns a rod with a specific shape in a matching hole to draw back the latch to release. Here’s the rim lock that we’re using for the porch door, which shows the old-school square hole very clearly. Modern sets often have a square spindle/hole, but may use another hard-angled shape. Note that this does not mean that you can just replace a modern doorknob with a vintage set! Here’s a diagram of a modern door knob and latch system (via Lorraine’s Leanings). Alternatively, some knob/latch models use a cylinder system. There’s a lot more going on in there than with the old knobs, largely because the locking function is now incorporated into the knob rather than in a separate deadbolt. But fear not! 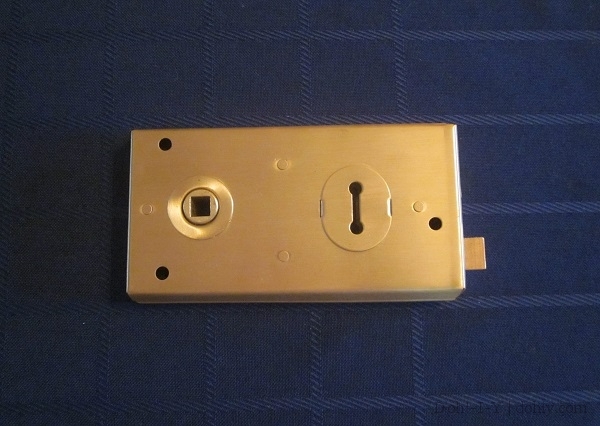 There are conversion kits available so you could use a vintage knob set on a door already drilled for a modern door knob (this ebay shop is a good source). If you’ve used one, I’d love to hear how they work. Ok, so far so good. What could go wrong?! Plenty. SET SCREWS ARE NOT A STANDARD THING. Set screws come in a variety of widths and lengths. Some have heads, while others have the head cut into the top of the thread. 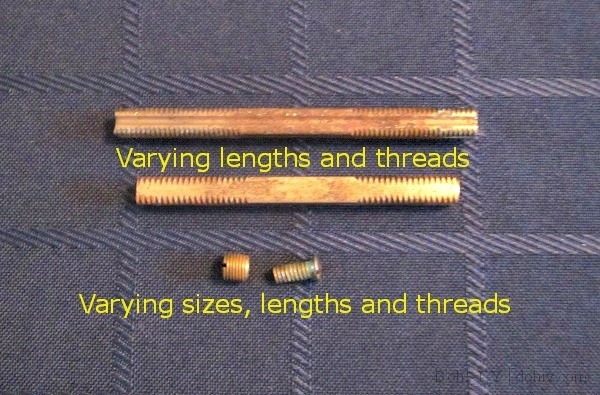 The thread can vary — some have 24 threads per inch (TPI), others more or less. Could be in inches, could be metric. I went to a few places looking for a replacement, and ended up at Seven Corners Hardware. If you work on old houses in Minneapolis/St. Paul, you’ve probably been to Seven Corners. If Seven Corners doesn’t have it, it just about can’t be had. Rule 1 of buying old door knobs you actually want to use: Make sure that both set screws are intact. No set screw, no problem! I’d simply hoark a doorknob off the back of one of the attic doors and screw the unusable knob on there instead. We never use the door knob on the back side of the door, so it won’t need a set screw, and I can use the unused knob and its set screw for the other side of the porch door. But guess what? SPINDLES ARE NOT A STANDARD THING. Spindles can be different lengths (you can cut down a long one, but not add to one that’s too short for a thick door). They can have different threads (usually 16 or 20 TPI). Sometimes, the set screw is designed to drop into a hole in the spindle (yikes). And usually the square part is 1/4″ but it could be 5/16″. Which will probably work, but at this point, I wouldn’t take anything for granted. If you flip your knob (not a euphemism! ), you may see a square or a round hole for the spindle. 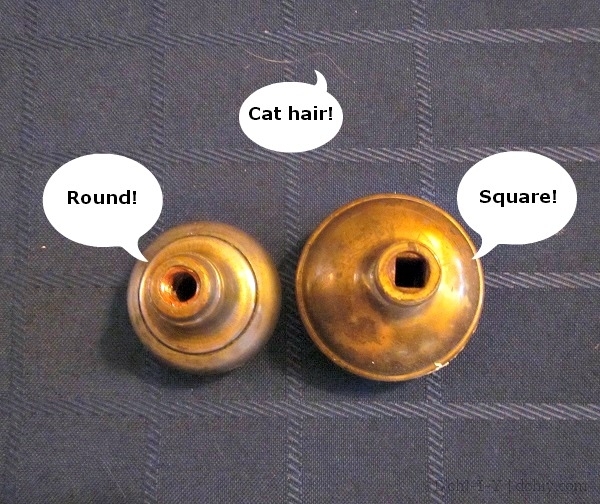 The square-holed knobs tend to be older; they are still threaded inside, no worries, but they are likely to be a different thread than the later, round-holed knobs. The one on the left is the one I bought for the porch door — it’s from the mid-1930s or later. The one on the right is the one I stole from the attic door — it’s from 1922 or earlier. When checking to see if a knob will work on a spindle, screw the knob on all the way. A thread that’s close may allow you to start screwing the knob on, but don’t be fooled — you need to keep going to make sure that it’s really a fit. Rule 2: Buy a matched set of knobs already on a spindle — or, if you just need a replacement knob (or spindle), take the knob(s) and/or the spindle with you when shopping. What kind of accessories? 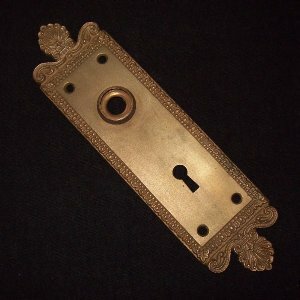 Well, there are roses (a/k/a rosettes) that go between the knob and the door and keyhole escutcheons, for instance. This isn’t such a problem as the stuff that makes the latch actually work, but it’s rather useful for being able to use your dang key. And rosettes look a bit ridiculous rattling around the spindle. It’s more important, though, if you have a whole plate for both things. If the keyhole in the plate is a half-inch above the actual keyhole in the door, then you’re not going to have a good time. It’s another thing to measure before shopping. Rule 3: Know all necessary relative measurements. Knob size doesn’t matter! Really! Except when it does. This is the only thing that wasn’t an issue for us, but it’s worth pointing out that door knobs can vary from 1.5 inches to 2.5 or more in diameter. For our rim lock, I wanted a smaller knob so that it would be easy to access the lock, but a bigger one would not have blocked it. You might also want to know how far out the knob juts from the door if you don’t have a lot of wall clearance. Just something to be aware of. Rule 4: Know the measure of your desired knob. Hopefully, these rules are a help to those of you in the operational door knob market. But here’s a thing I learned when researching for this post: people collect door knobs! And why not? They can be really beautiful, and they certainly are well-made. Plus, you don’t have to worry about all this fitting and measuring business if you are just collecting them to look pretty! If you are so inclined, check out the Antique Doorknob Collectors of America site, which has all sort of info. Wow, it would be nice to shop for a doorknob because it’s pretty rather than because you need it to work! This entry was posted in D'oh!, Porch, Repair & Maintenance, Salvage, Windows & Doors and tagged antique doorknob, retrofitting doorknobs, spindle door knob, using a vintage doorknob with a new door latch, vintage doorknob. Bookmark the permalink. 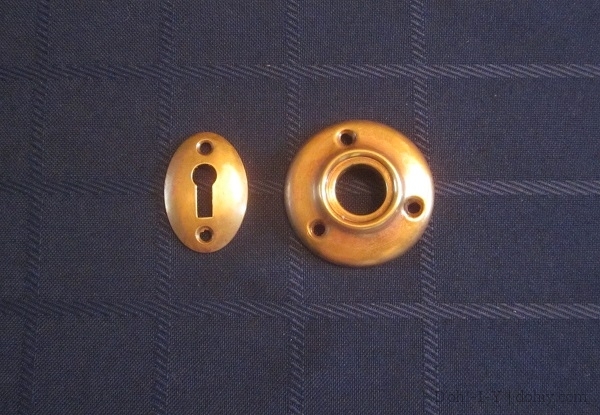 I have two sets of door knobs that consist of a door knob attached to a brass cup ,inside the cup is a thread that needs to screw onto threaded fitting to attach it to the door.Can you tell me were I can buy this type of fitting,the shafts/spindle just slide into the door knob, convential door knobs attach to the shaft/spindle with a screw and if the door knob has a attached cup/backplate, the backplate is drilled to take screws.I’ve never come across this type of fitting before. Anthony, I haven’t encountered that either! Do you have a picture? Probably if you called or stopped in at an architectural salvage place, they would be able to tell you all about it. Those people are amazing. square spindles do not fit in round holes. what to do? Shelly, sometimes the spindles are square but threaded for a round hole anyway, but maybe you just have a mismatch. That’s the thing — they aren’t super-standardized. If you have a salvage place near you, take it in and see if they have a match. Hope you find what you need! Thanks for stopping by.